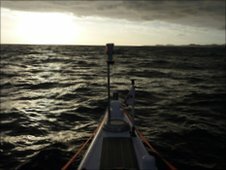 A team of rowers from Durham University has broken the world record for rowing across the Atlantic. The previous record for crossing east to west was just over 33 days. 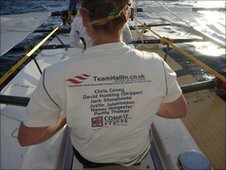 Team Hallin have succeeded in rowing from the Canary Islands to the Caribbean in 31 days, 23 hours and 31 minutes. On their journey the team faced nearly being hit by a ship and being burnt by the flare set off to warn it to change its course. Naomi Hoogesteger teaches Modern Languages at Durham University. It was her leg that came into closer contact with the propellant from the flare than she'd have liked. She said: "For some reason I think it just became very interested in us. It was a very big cargo ship, just turned course and came directly towards us. "Someone set off a white flare which usually means change your course, don't come any nearer but, because of the wind, it just blew some into my leg and I got a bit burnt." 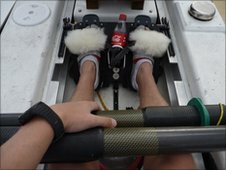 This Durham University modern languages teacher has been sharing a 40 foot, multihull rowing boat with five men. They've been rowing in two hour shifts, 24 hours a day which, with three rowing at any given time, meant no more than two hours off. There have been blisters to contend with too. Not just one or two, but dozens. They dealt with those they had to sit on by cutting out sections of their padded seats to alleviate the pressure. Despite this, they didn't lose their sense of humour. Surprisingly, Naomi described being woken up in the middle of the night for what turned out to be no reason at all as funny. She said: "You get so tired. Obviously the night shift is quite difficult because you're naturally meant to be asleep at that time. "The shift before us, they thought that they saw some red flares being let off which are normally let off when yachts or boats are in grave danger. "But actually I think they might have been just hallucinating, I think they were just shooting stars. "They said a yacht was sinking and they made us all get up, which was probably one of the funniest incidents." Considering it has been very hot, they've been aching all over and what little sleep they got was in a space half the size of a bath, seeing the funny side of things would have been an advantage. After being greeted by friends and family, the crew celebrated their arrival in Barbados with two swift dinners, a couple of beers - and sleep. Naomi's mother, Denise, said it had been the longest, and most worrying, 31 days of her life. She said: "I never doubted she wouldn't cross the Atlantic because I knew she'd get across the Atlantic. But to do it in record time is just absolutely fantastic. "I just don't know what to say. Saying 'well done' seems so tame, I'm just completely overwhelmed." As well as attempting to break the world record the team were trying to raise £60,000 for the charity Combat Stress which cares for ex-servicemen and women. So far they've achieved one of their goals, arriving in Barbados on Monday, and they're half way to their fundraising target.